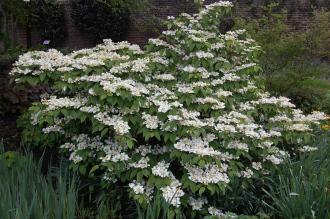 Viburnum plicatum ‘Mariesii’ is a medium/ large deciduous shrub with tiered branches and a spreading habit. Its dark green leaves are opposite, ovate with serrulate margins, deeply veined up to 10cm long and 6cm wide. Its leaves turn purple/ red before falling in autumn. Its branches are horizontally tiered giving the variety ‘Mariesii’ its distinct habit. Its white flowers are produced in corymbs which are up to 10 cm across. Its fruit is a spherical drupe, up to 1cm long and are red, becoming black as they mature. The etymological root of the binomial name Viburnum for old Latin name for the Wayfaring tree (Viburnum lantana).Plicatum is derived from the Latinplico meaning ‘folded’, referring to the flowers of the plant. The landscape architect may find Viburnum plicatum ‘Mariesii’ useful as a specimen shrub due to its interesting form and prolific spring flowering. It may be used as a woodland edge plant or in other locations in dappled shade. Ecologically, V. plicatum ‘Mariesii’ is attractive to bees and pollinating insects. Its fruit are attractive to birds. The Royal Horticultural Society has given V. plicatum ‘Mariesii’ their prestigious Award of Garden Merit in 1993. V. plicatum ‘Mariesii’ prefers moist, fertile, humus rich well-drained soils. It tolerates most pH of soil. 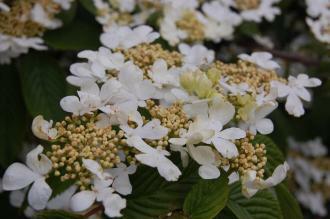 Viburnum plicatum ‘Mariesii’ requires little maintenance.